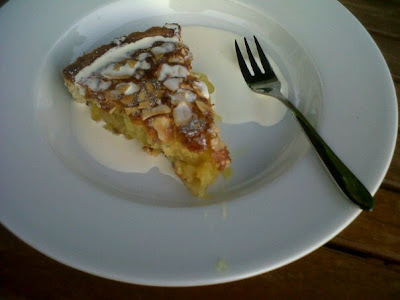 Emily's Recipes and Reviews | UK Food Blog | Leicestershire : lovely lemon and almond frangipane tart. lovely lemon and almond frangipane tart. preheat the oven to 180 degrees, gas mark six. this is best served in a 9" tart tin so grab one of those, or something similar and line it with a little butter. a good tip for this is to use the butter wrapper to spread it around the tin evenly. to blend it in to fill the gaps, as in my picture. ignore the lemons, they were there to make it look pretty. zest until creamy and airy. use the smal lest sized side of the grater for a subtle lemon taste, with perhaps a few larger shavings for a really fresh flavour. now the next part is a little bit of a juggling act. and perhaps time to bring in your glamorous assistant/mum/unsuspecting (but also quite hungry) housemate. for best results, add the eggs one by one, beating as you go, with a spoonful of the ground almonds each time. lastly mix in the remaining ground almonds and flour. rather fiddly yes, but worth it for a really light and tasty, sponge-like filling. and spoon the frangipane on top. use the back of the spoon to spread evenly. in fact, i haven't tried it yet but i'm sure if you could adapt this recipe with different types of jam. but don't hold me to that. serve with whichever cream takes your fancy, slice (or don't slice) and enjoy! How long should I cook this for? posh pub grub: the wick at both ends review. easy peasy red pepper and goats cheese tart.